I came across Ohaly’s work via dsgnwrld and then couldn’t decide which product i liked most. They are all so fresh and simply put, awesome. ^ Look at this table. The legs are in such a natural movement and ‘naturally’ the hard glass would break this flow but yet in this work, the glass gives and the flow is not broken. 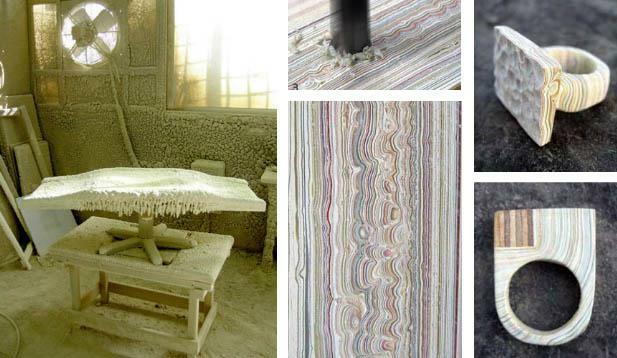 ^ Months and months of applying acrylic paint to a wooden table Ohaly created a thick surface of paint. This he then sliced into rings and other jewelry pieces. The layers of coloured paint create a very interesting effect – it looks like the wood grain but yet it’s acrylic. ^ These bird lights are just too wonderful for words. 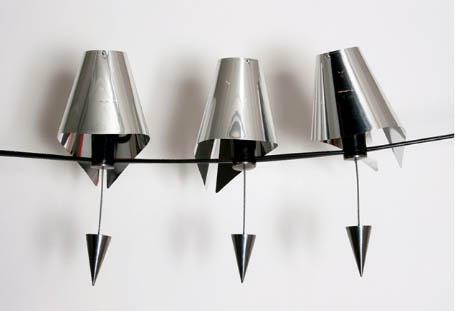 Inspired by the way birds sit on wires, you can also move these lights along creating groups or individuals. To see more of Italy Ohaly’s work visit his website here. This entry was posted in Blog and tagged bird lights, Furniture design, furniture inspired by nature, glass, italy ohaly, nature design, ohaly, table, wood, wooden ring. The lights are amazing! Thanks for sharing! thos tables are too cool! Cool things!My favourite is the light on the last picture.Have a nice weekend.